The feverfew herb has an appearance similar to a daisy and is actually from the daisy and sunflower family. It grows about 2 feet high and has the scientific name of parthenium. It is believed this name was derived from the herb being used to treat someone who had fallen from the Parthenon in Athens, thus saving their life. In ancient Greece, feverfew was also used to reduce swelling and to ease menstrual cramps. Today it is more commonly used to treat mild migraine headaches, as the feverfew herb contains parthenolide, which helps prevent blood vessels dilating. Acute migraine suffers may benefit from the use of this herb, but should always consult their doctor before doing so. Feverfew has many health benefits apart from giving relief to migraine sufferers. As the name suggests, it also helps ease the symptoms of fevers and lessen rheumatic pain. Although feverfew does have anti-inflammatory properties, it has not been proven in the treatment of arthritis. Feverfew herb is available as a liquid extract, a capsule, or in tablet form, and the fresh leaves can be chewed for migraine relief. Also the leaves can be used to make herbal feverfew tea. The leaves can be dried or frozen and will last quite a while. Only three or four leaves will be needed to make a feverfew leaf tea, but as the leaves have a bitter taste, a little honey added to the tea will make it a much tastier drink. When buying the capsule or tablet supplements, check the ingredients, as they should contain no less than 0.7% parthenolide, although some sources state upward of 0.4% and also include magnesium and riboflavin (B12), which works well with the feverfew for easing migraines. When using feverfew for migraine relief, it is worth noting that it could take around four weeks for the herb to start to work, but it should help to lessen the frequency and severity of migraine attacks. If there is no improvement to symptoms or if the symptoms or frequency increase, seek medical advice immediately. Possible feverfew side effects are numerous, although not serious. Flatulence, diarrhea, and vomiting are among the list. Also a small number of people who have chewed the herb have reported developing mouth ulcers. Allergic reactions have been reported after the use of this herb. 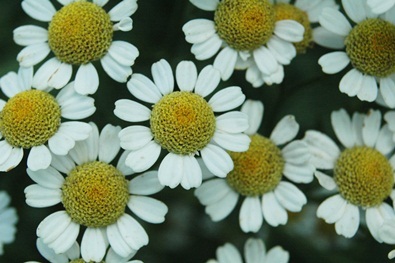 People who suffer allergies from chamomile or ragweed should possibly avoid use of feverfew. As feverfew could possibly increase the tendency to bleed, anyone taking blood thinning medications such as warfarin or aspirin should consult a medical practitioner before taking the feverfew herb supplement. Feverfew is not recommended for use on children under the age of two. Doses for those two years and older should be adjusted according to bodyweight. Professional advice is highly recommended to ensure correct dosages are given.